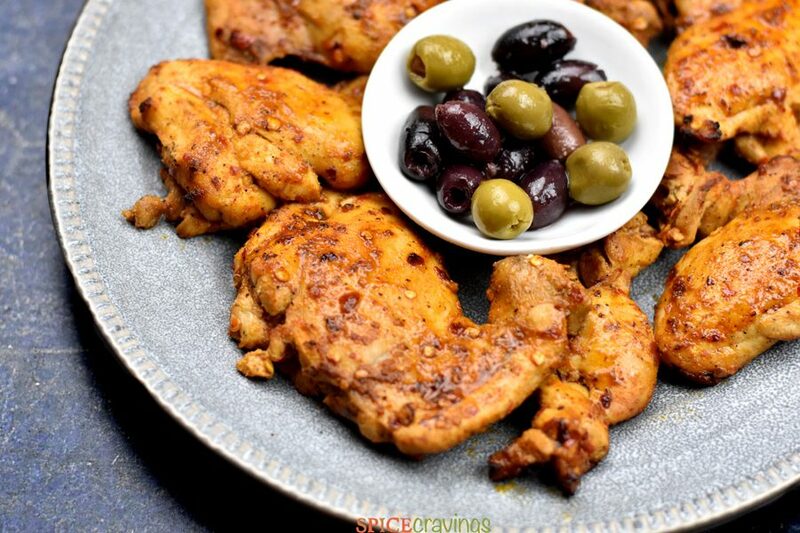 Perfect for any meal this Mediterranean Chicken is flavored with lemon, paprika, cumin, cinnamon and oregano. Whether you make it in your Instant Pot, oven or stove-top, it comes out delicious and juicy every single time and can be used in a variety of dishes. 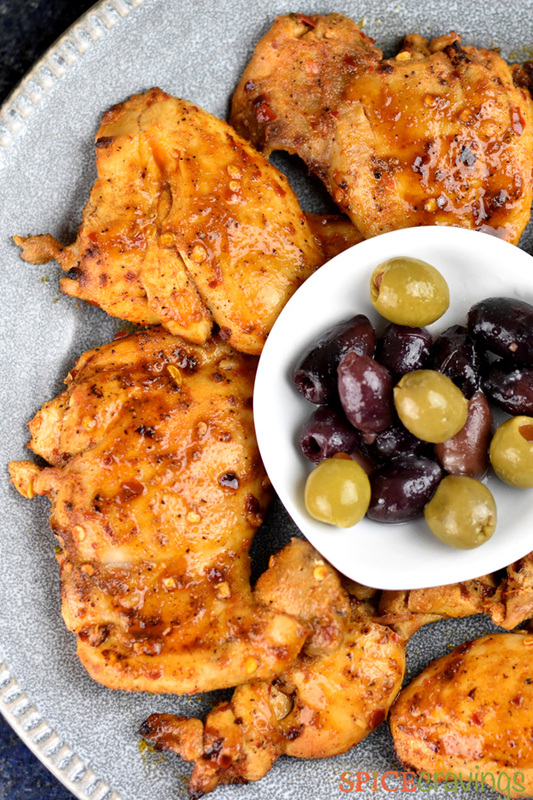 This is one of my go-to marinades that flavors the chicken in very little time. Whenever I have time, I prefer to refrigerate it for 10 minutes. That adds more flavor and keep the chicken moist and juicy after cooking. I put this marinade together with mostly pantry ingredients. In a mixing bowl or a large ziplock bag, I combine, olive oil, lemon juice, salt and pepper, ground cumin, cinnamon, garlic, chili flakes, oregano and paprika. This marinade can be used for assorted vegetables, lamb, fish and even Shrimp. This recipe is part of my meal prep repertoire over the weekends. I usually make a double batch on Sundays and use it for multiple meals through the week. 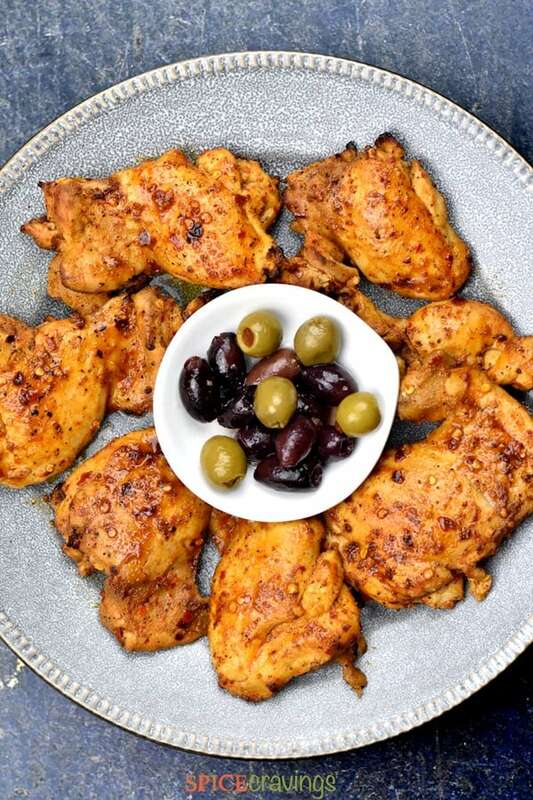 Some favorite meals that I use this chicken for are Greek Salad, Chicken wrap or Chicken Sandwiches for the kids. It works great as a Pizza topping too. It makes for a real satisfying dinner when I pair it with Saffron rice or Quinoa Tabbouleh Salad. Using a sharp knife, make shallow parallel cuts in one direction, about 1/4 inch deep and 1/2-inch apart. 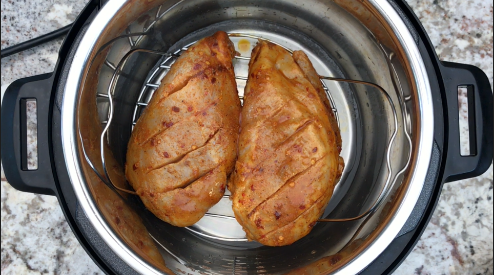 I prefer to use the pot-in-pot method to cook the marinated chicken in the Instant Pot. By doing that the marinade gets absorbed in the chicken really well. If I were to place it directly in the broth, those flavors would get diluted. Step 1: Marinade chicken by combining all the spices, lemon juice and olive oil in a large ziplock bag (or mixing bowl). Add chicken, close the bag and toss it well. Depending on time, refrigerate it for 10 minutes. Step 2: Add water to the cooking pot. 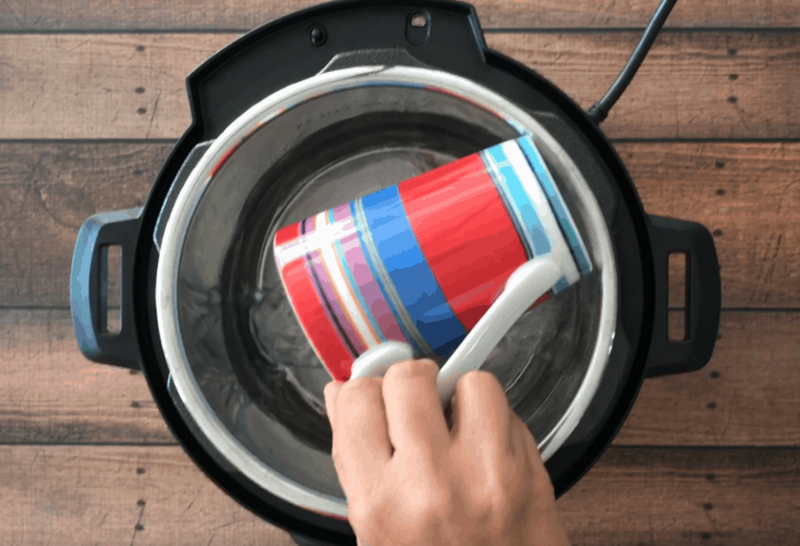 Water quantity depends on the size of cooker you have, 3/4 cup for a 3QT, 1 cup for 6QT, 2 cups for 8QT. Step 3: Place the trivet in the pot. I like using trivets with handles, it comes in handy when pulling it out after cooking. I recently got a silicone trivet that looks great for this. Step 4: Using tongs, place the chicken pieces on the trivet. Don’t over crowd the trivet. If you have too many pieces, you can stack another trivet on top of the other one and place the additional chicken on that. 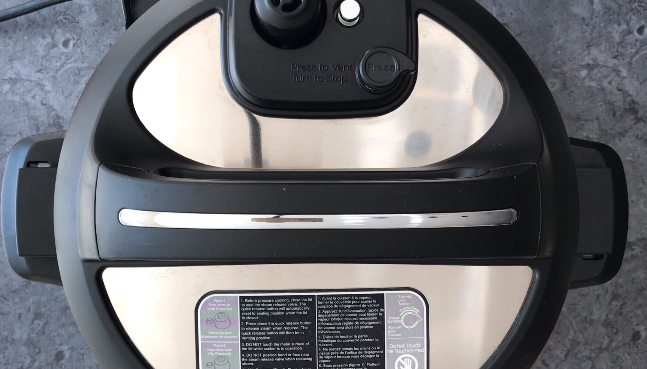 Step 5: Close lid, set vent to sealing position in DUO models and set the pressure cooking time. I use manual or pressure cook mode (high pressure), 6 minutes for chicken thighs and 8 minutes for chicken breast. 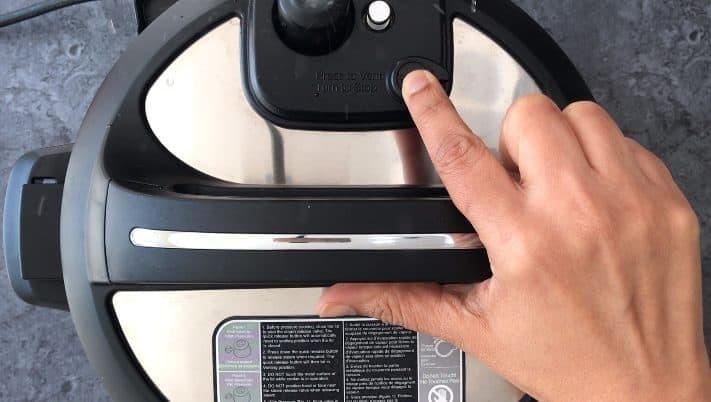 Step 6: After cooking, let the pressure release naturally (NPR), else wait 10 minutes after cooking time, and then release pressure manually (QR). In DUO models, turn the valve to ‘Venting’ position, and in ULTRA, press down the pressure valve. 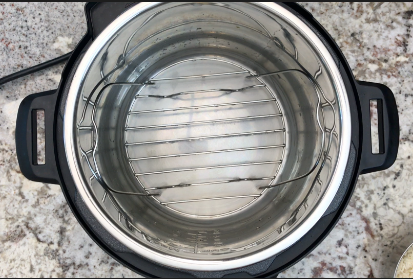 Once the pin drops, open the lid away from you to avoid the hot steam that releases. Here’s an easy technique that shows you how to slice chicken at an angle, also referred to as against the grain. Against the grain just means in the opposite direction of the muscle tissue. Use tongs to hold the chicken still on a cutting board. Hold a sharp knife at a 45 degrees angle over the chicken. Start cutting the chicken from the pointed edge to the rounded (thicker) edge. 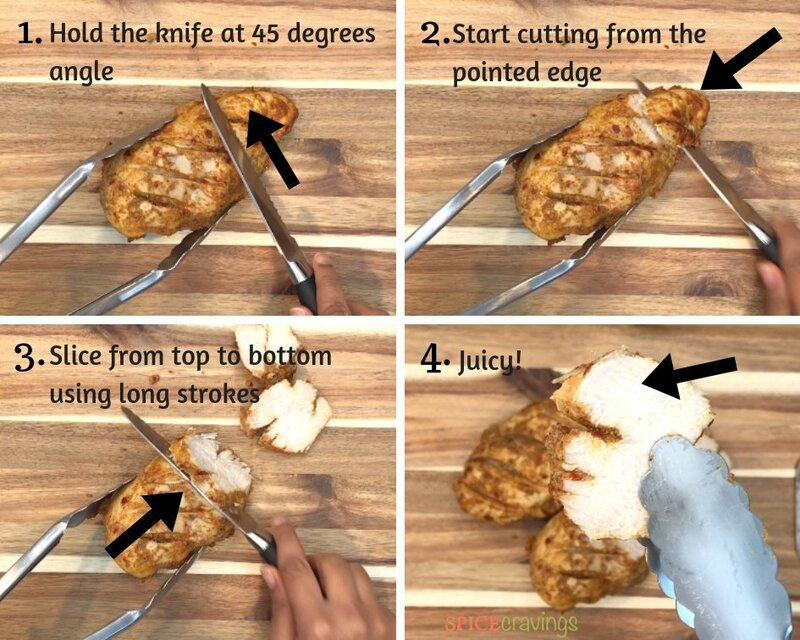 Slice the chicken from top to bottom using long knife strokes. Cut the chicken as thin or as thick you like. I make 1/4 inch slices for sandwiches, and 1/2 inch slices for serving it for dinner or salad. When using chicken breast, score the chicken lightly so the marinade can penetrate and flavor the chicken evenly. If using chicken thighs, trim off the excess fat, that allows for an even crisp exterior. 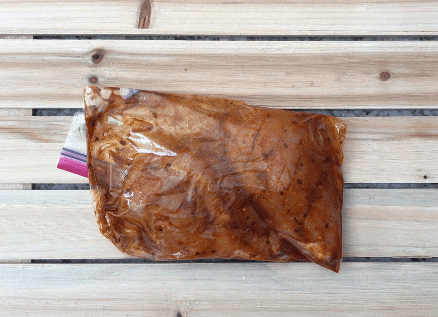 If you have the time, let the chicken marinade for 10-15 minutes in the refrigerator. The chicken come out more moist and juicy this way. 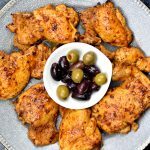 This chicken can be cooked in multiple ways: on an outdoor grill, oven broiler, oven-baked, pan-grilled and even steam-cooked in an Instant Pot using the pot-in-pot method. 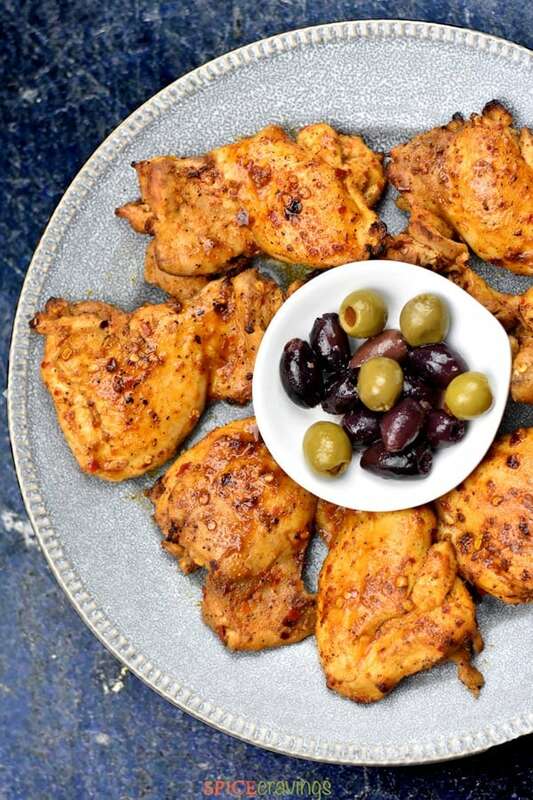 Mediterranean chicken is an excellent way to enjoy a low-carb meal by pairing it with a greek salad. For meal-prep, let the chicken cool down completely before slicing it. 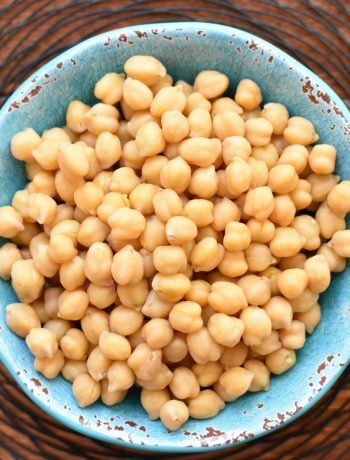 Store it in an air-tight container and refrigerate up to 4-5 days. 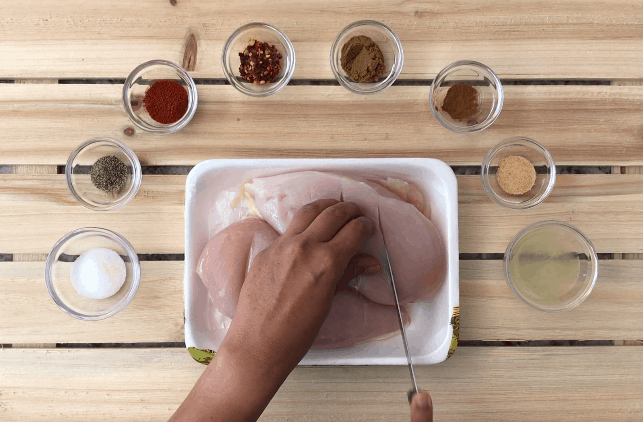 If using Chicken Breast: Score the chicken using a knife so that the spice rub gets absorbed. If using Chicken thighs, trim off the extra fat and cut into half width-wise. In a gallon size ziplock bag (for easy clean-up) or a bowl, add all ingredients listed under “Spice Rub” and mix well. Add chicken pieces. Seal the ziplock bag. Mix well to get chicken coated with the rub. Refrigerate for 15 minutes if you have the time (optional). Chicken Breast: Place the chicken breast on a lined baking sheet. Turn on the oven on BROIL mode. Broil chicken for 8 minutes on the first side. Chicken should be golden brown by now. If not, broil it for another 2 minutes. Flip the chicken and broil for 6 minutes on the other side. Cooking time may differ based on the thickness of the chicken, so adjust accordingly. Rest 5 minutes before slicing. Chicken Thighs: Place the chicken thighs on a lined baking sheet. Turn on the oven on BROIL mode. Broil chicken for 6 minutes on the first side. Chicken should be golden brown by now. If not, broil it for another 2 minutes. Flip the chicken and broil for 5-6 minutes on the other side depending on the thickness. Rest 5 minutes before slicing. Turn ON the Instant Pot. Pour 1 cup water in the inner pot. Place the trivet in. Place the chicken breast on top. Close the lid. Cook on Manual or Pressure Cook (high-pressure) for 8 minutes for Chicken Breast, or, 6 minutes for thighs. 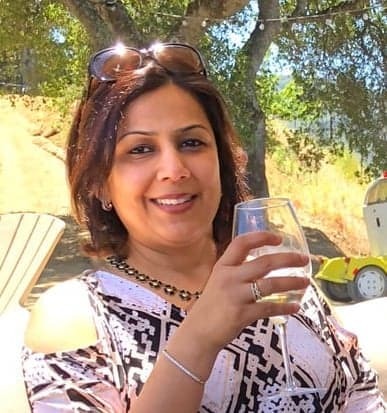 Release the pressure naturally (NPR), or QR after 10 minutes. Rest 5 minutes before slicing. Heat a skillet on medium-high for 30 seconds-1 minute. Place the chicken breast and cook for 7-8 minutes on the first side. Flip and cover the pan with a lid. Cook for another 5-6 minutes. Cooking time may differ based on the thickness of the chicken breast, so adjust cooking time accordingly. Rest 5 minutes before slicing. If you have the time, let the chicken marinade for 15-20 minutes in the refrigerator. The chicken come out more moist and juicy this way. Note: The nutrition facts below are my estimates and for the chicken only, they do not include sides. If you are following any diet plan, I recommend cross-checking with your preferred nutrition calculator. This recipe was originally posted in 2017, but was updated in April of 2019 with new photos, helpful information, tips, and step-by-step photos.